1. 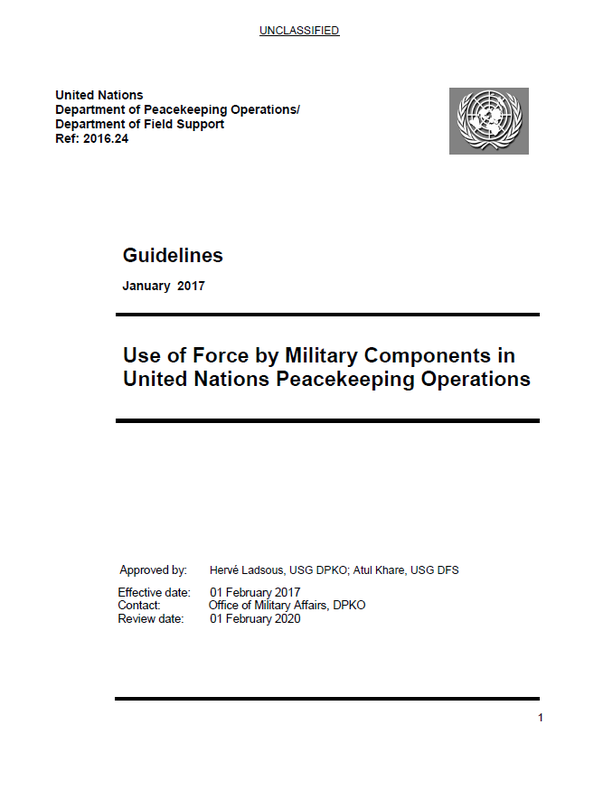 This document is intended to provide clarity in the appropriate use of force at the tactical and operational levels of United Nations peacekeeping missions. 2. Clarity in the appropriate use of force is vital to a United Nations mission’s military personnel confronted by the full spectrum of complex peacekeeping challenges. It is equally important to troop contributing countries (TCCs) providing peacekeeping military contingents. These guidelines are intended to mitigate hesitation, accelerate decision making, improve performance and ultimately protect lives and property. 3. These guidelines briefly highlight the strategic considerations that guide, oversee and provide the resources for the operational and tactical use of force. While the strategic considerations of the use of force are rooted in the core peacekeeping principles, mission mandate and rules of engagement, the guidelines recognize that political and other context specific factors influence the strategic considerations on the use of force. The main emphasis, however, is on the operational and tactical considerations regarding the use of force. This document examines the required thinking and action (including situational awareness and operational/strategic communications) at these levels to pre-empt, deter, contain or respond to threats without excessive use of force. 4. These guidelines apply to all members of the military component deployed in a United Nations peacekeeping operations, senior mission leaders, as well as staff members of DPKO/DFS at United Nations Headquarters (UNHQ). TCCs will also find this document helpful as they train and prepare their commanders and contingents for United Nations peacekeeping operations. The clarifications contained herein supplement, but do not replace, mission-specific rules of engagement (ROE) and other applicable guidance issued by the Under Secretary General (USG) for DPKO, which have precedence. 5. Numerous after action reviews and discussions with TCCs have identified a gap in the understanding of the use of force despite existing mission-specific rules of engagement. These guidelines are accordingly intended to address the hesitation or lack of willingness/readiness to use force, when appropriate, in order to carry out mandated activities as well as to address the use of excessive force. It provides guidance on the use of appropriate force. 6. “Force” is defined as the use of, or threat to use, physical means to impose one’s will. In peacekeeping operations, peacekeepers are authorized to use force in self-defense and to execute their mandated tasks in appropriate situations. Depending upon the mandate, this may include the authorization to use force for the protection of civilians. The objective of the use of force in peacekeeping operations is to influence and deter, not necessarily to defeat threats seeking to threaten or harm United Nations personnel or associated personnel or the civilian population. In some cases, the use of force may also be authorized to respond to other threats, including those caused by armed spoilers intending to distract peace processes. 7. The legal basis for the use of force by peacekeepers resides in the mandate of the peacekeeping mission, as reflected in the relevant resolution(s) adopted by the Security Council. The use of force must be exercised in a manner consistent with the mandate. It may be used in self-defense as well as in situations in which the mission is specifically mandated to use force as listed in the ROE. Mission-specific ROE provide the authority for the use of force as well as directions to operational commanders delineating the parameters within which force may be used. 8. The use of force in peacekeeping operations must comply with international laws, including applicable international humanitarian law and human rights norms, principles and standards. At all times, the use of force must be consistent with the principles of gradation, necessity, proportionality, legality, distinction, precaution, humanity and accountability. Any force used must be limited in its intensity and duration to what is necessary to achieve the authorized objective and, commensurate with the threat. 9. 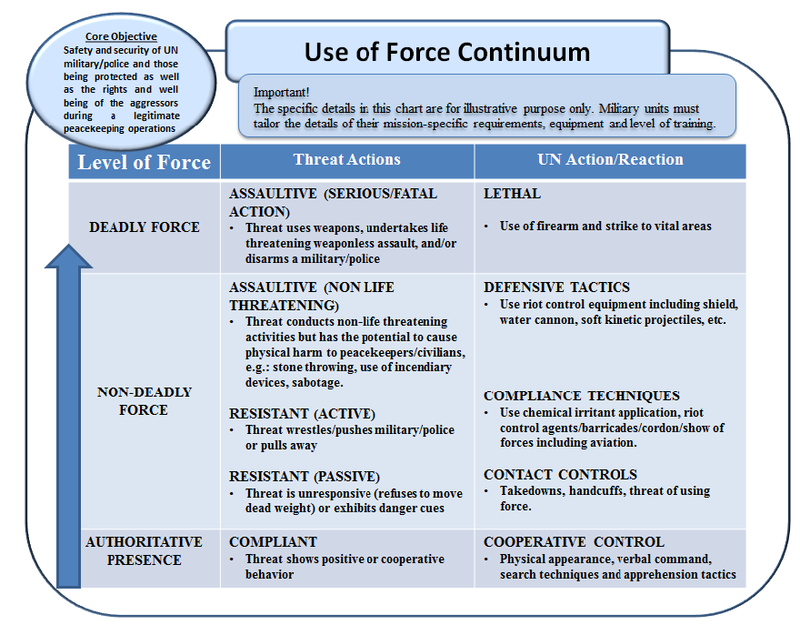 The use of force is a command responsibility. The Force Commander is responsible for disseminating mission-specific ROE approved by the USG DPKO to all subordinate commanders and is ultimately responsible for ROE enforcement. It is the responsibility of the commanders of all national contingents to ensure that all those under their command understand and follow the ROE. 10. Whenever the operational situation permits, every reasonable effort should be made to resolve a potentially hostile confrontation by means other than the use of force. The use of force may be avoided through mediation, negotiation and the good offices of civilian peacekeeping staff. This should be complemented by the skillful use of a deterrent posture; such as placing sufficient forces at the scene of potential violence to demonstrate the United Nations’ intent and capability to respond to any act of violence. The use of force may also be avoided by for example, adopting a robust mission communications plan and/or through community engagement or assistance from local authorities. The ability to deter hostile intent and act successfully relies on clearly communicating capacity, requisite will and confidence in carrying out the mandated tasks. However, peacekeepers must be prepared at all times to act swiftly and decisively with the requisite force to achieve objectives as authorized by the mandate and ROE.